The small book below is a short read and it’s my gift to you. Will you take a moment to explore the great news of the Bible that most religions completely ignore? It’s a subject that has eternal implications and it’s worth taking a few moments to consider. Let me know your response after you read. Also, consider passing it along to a friend. This is good news that everybody needs to read! 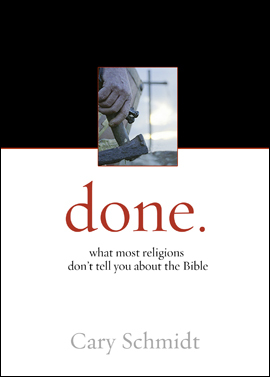 Done is also now available for the Amazon Kindle! Done is free at the iBooks store through Apple! Pingback: Joy-Filled Days - Raising Kids. Keeping House. Choosing Joy, Everyday!